Vine Spot recently jumped back in the saddle and rode into Loudoun County to visit our friend, Kent Mars, owner and winemaker of Village Winery. We did not visit Kent at his charming winery located in Waterford, VA, however; instead we visited Kent at his kiosk, which is located at the Leesburg Corner Premium Outlet Mall. A winery at a Shopping Mall you ask? That’s correct friends. It was early November of 2006 when Kent told me of his holiday plans to promote Village Winery, as well as Loudoun wines and target the holiday shopping crowd at the Leesburg Outlet Mall. I thought to myself, “What a great idea for the holidays;” after all, Kent’s popular dry Apple wine and the unique Elderberry wine would make for excellent mulled and spiced wine holiday selections. Of course, with December being a busy shopping month and longer than usual lines and consumers moving at a frantic pace, what better way to take a time-out than to enjoy a glass of wine – truly my kind of shopping! Well, let’s just say that Kent Mar’s innovative idea to setup shop at the Leesburg Outlet Mall has been very successful. Thus, it did not surprise me that seven months later Kent is still representing Village Winery, and in many ways Loudoun Wine Country, at the Leesburg Outlet Mall. At the kiosk, Kent offers guests samplings of Village Winery’s hand-crafted wines and is more than happy to discuss and share his enthusiasm for Virginia wine with all who wish to know how he turns grapes and other local fruit into the wines we so enjoy. Periodically, Kent offers local cheeses for sampling and purchase that can be paired with one of his tasty Virginia wines. At the kiosk, wines can be purchased by the bottle, and whether you purchase a bottle or not, Kent gives all guests a 2007 Loudoun Wine Trail Guide so that they can become familiar with Loudoun Wine Country. While I was at the busy kiosk, over half of the guests were not aware that they were within 10 miles of some of Loudoun’s top wineries. Thus, outside of being a supporter and promoter of Loudoun wine and an emerging local winemaker, Kent is a people person, so whether you find him at Village Winery in Waterford, VA, or at the Leesburg Outlet Mall, you are certain to have a pleasant and enlightening winery experience. So with summer upon us, you must be wondering about Village Winery summer offerings, right? Well, Village Winery has four wines, which in my humble opinion are perfect for summer and very popular with consumers. Kent’s newly released Cabernet Franc Rosé 2006, which sold out before I could try it, is described as a dry wine with nice up front bright berry fruit with good acidity , which makes it remarkably versatile with most foods and a good aperitif wine. The good news is that Kent will be bottling more of this popular selection and I’m eager to get my hands on a few bottles. Another selection, Kent’s dry Apple wine, has really taken off with consumers and is a refreshingly fruity wine, not sweet, made from local fruit that is barrel aged and makes for an excellent summertime quaffing wine. A wine that has made Village Winery unique in Virginia, and appears to have quite a following, is the Elderberry wine. 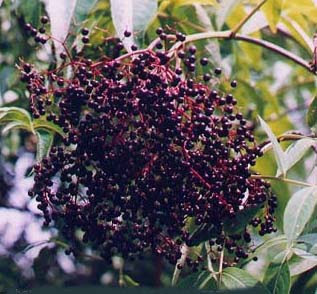 The elderberry is a fruit bearing shrub whose many uses include tea, jams, brandy, pies, etc., and in Kent’s case, a dry medium bodied red table wine. A blind smell and sniff of this wine would have you guessing Chambourcin or perhaps even a soft Merlot – its richness and good fruit flavors makes it a prime candidate to be paired with light chesses, roasted chicken and game dishes. Another good summertime selection is the Village Winery Viognier 2006, which is the winery's first vintage. The Viognier is a soft wine offering floral and perfumed aromas with good citrus and subtle tropical fruit flavors on the palate and is another great summertime selection for pairing with grilled chicken and seafood dishes. Village Winery also offers some bolder red wine selections in a tasty Merlot, a Cabernet Franc and a Merlot & Cabernet Franc blend that are definitely worth seeking out. In closing friends, I recommend a visit to Kent Mar’s Village Winery to stock up on some of their great summertime wine selections. Whether you visit the winery in Waterford, or the kiosk at the Leesburg Outlet Mall, Village winery is sure to satiate your summertime needs. If your plan is to visit the winery be sure to pack a picnic basket and sit under the mature trees besides the rustic barn and enjoy the rural country surroundings. Very relaxing! When you decide to visit Village Winery friends, be sure to let them know you read about them here on Virginia Vine Spot. Stay tuned, Dezel samples a few Loudoun gem-stones.